Members of the Piney Woods Camerata rehearse for their performance at 4 p.m. Sunday, Feb. 25, in Cole Concert Hall on the SFA campus. NACOGDOCHES, Texas - The Piney Woods Camerata at Stephen F, Austin State University will perform great works from the Baroque Era when the faculty-student string ensemble performs at 4 p.m. Sunday, Feb. 25, in Cole Concert Hall on the SFA campus. The recital is part of the SFA School of Music's Calliope Concert Series. 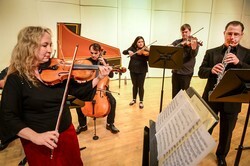 "As this year is the 10th anniversary of the Piney Woods Camerata ensemble, we wanted to plan a concert that featured some of our favorite Baroque composers," said Dr. Jennifer Dalmas, professor of violin at SFA and an ensemble member. Works by J.S. Bach, George Frideric Handel, Arcangelo Corelli, Georg Philipp Telemann and Henry Purcell will be represented in the program. Kerry Hughes, adjunct professor of oboe, and Dalmas will perform Bach's Concerto for Oboe and Violin in C minor, BWV 1060. Hyun-Ji Oh, SFA pianist, will also join the group for the first time, playing the harpsichord. Bach's Concerto for Oboe and Violin in C minor was written around the same time as his Brandenburg Concertos and cello suites while he was living in Cothen, Germany. "This piece is in standard concerto form, with three movements in fast-slow-fast tempos and lots of wonderful interweaving melodies between the solo instruments and orchestra," Dalmas said. The Purcell Chacony in G minor is based on the French Chaconne, which is a set of variations over a repeating base line. "This work is one of the finest Baroque examples of this form," Dalmas added. Although Corelli was not the most prolific composer of the Baroque Era, his works were very influential, according to Dalmas. "His 12 concerti grossi really establish that form of composition, and the first of the set that we will play is a perfect example of his mastery," she said. "We also chose this work as it was featured on our very first Camerata concert 10 years ago.